In this series, we’ve done a review of mathematical notation, with an eye on how each notation helps or hinders student learning. The focus here is modest: on what teachers can do, even if their textbook sticks to the standard notation, to help disambiguate the standard notation for students. In the last several posts, we’ve been looking at notations for expressions. In the previous post, I reviewed slight variations on the standard notation for expressions; in this post I’ll offer a more drastic variation. This drastic variation doesn’t exhaust the subject – we’ll return for more later. Let’s start with an expression given in standard notation: , and remind ourselves that its meaning is derived from the sequence of operations that are indicated: some values are to be multiplied, others added, etc. This same meaning is expressed above in the form of a tree, and this tree is a particular kind of notation for the expression. (Some useful vocabulary: the tree is said to have nodes and branches. One node is called the root, and is shown at the bottom. 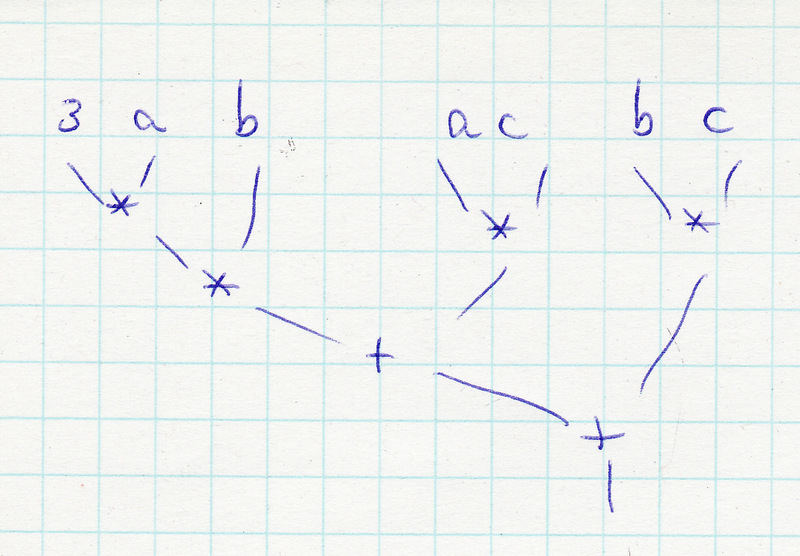 Other nodes are called leaf nodes and represent the starting points: e.g. 3, the value of a. The remaining nodes are called internal nodes, and represent operations.) Here, “*” represents multiplication of two numbers, and “+” represents addition of two numbers. Somewhere along the way, students become familiar with the idea that the operations of addition and multiplication are special compared to subtraction, division and exponentiation: when you add a bunch of numbers, it doesn’t matter in which order the addition is done. 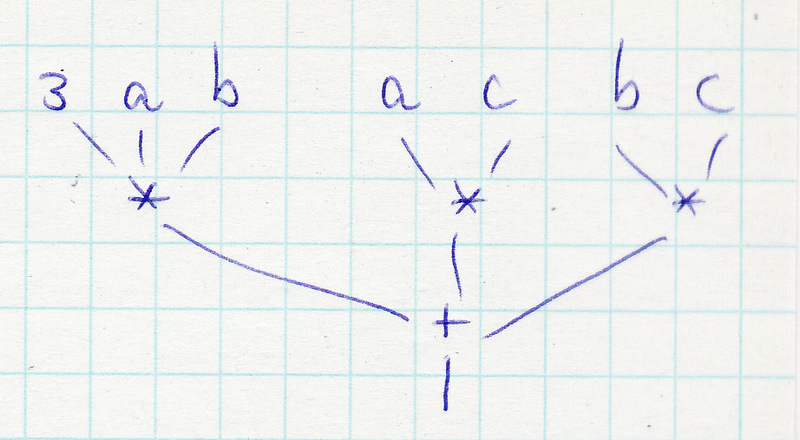 If I need to add a and b and c, I can add a + b and then add c to the intermediate result; or I can add b+c first and then add a to it; or I could add c+a and then add b to it. In formal terms, addition is both commutative and associative. Multiplication is commutative and associative as well. This notation can peacefully coexist with the standard notation in the textbooks. Students get the pictorial form without any trouble, and can manipulate the expression trees with ease. They tend to think of the internal nodes as little machines that are sitting there waiting for inputs, and then producing an output. I intend to come back to this notational scheme and other variations in future posts – I want to take an excursion first to look at notation for functions: I think this will prove very fruitful. This entry was posted in Uncategorized and tagged education, equivalence, math class, naming, notation, representations. Bookmark the permalink.